This season, Kony Ealy recorded 37 tackles, including 12.5 for loss, 7.5 sacks, three forced fumbles, one fumble recovery and one interception that he returned 49 yards for a touchdown. ST. LOUIS — The massive mural in the lobby of the Mizzou Athletics Training Complex is an impressive demonstration of the development of the Tigers football program over the past decade. The mural features larger-than-life photos of 2007 Heisman Trophy finalist Chase Daniel, 2009 NFL first-round draft picks Jeremy Maclin and Ziggy Hood, 2010 first-rounder Sean Witherspoon, 2011 first-rounder Blaine Gabbert and 2013 first-round pick Sheldon Richardson. Kony Ealy could join that mural before long. The Missouri redshirt junior defensive end, a 6-foot-5, 275-pound physical specimen from New Madrid, Mo., will soon have a difficult decision to make regarding his future. Ealy could announce following the Cotton Bowl that he will leave school with one year of eligibility remaining to enter the 2014 NFL Draft — there’s a chance he could become the sixth Mizzou player in six years to be a first-round draft pick — or he could decide to return to Columbia for one more season and try to improve his draft stock. Either way, it’s not a bad position to be in for a small-town kid from Southeast Missouri who grew up as a standout on the football field and basketball court. "I’ve just been versatile all my life and it’s adapting to really what I’ve had to face and I think I’ve adapted well," Ealy says. "Coming in I redshirted my freshman year as I should have. You had All-Americans in front of you like Aldon Smith, Brad Madison and Jacquies (Smith). It gave me opportunities to learn and learn from those guys who are at next level doing great things and learn from Coach Kool who is a good coach and has put into the NFL multiple NFL-caliber players." Coach Kool — aka Mizzou defensive line coach Craig Kuligowski — has two of his proteges on that mural already. He could have two more in Ealy and fellow defensive end Michael Sam, who was a unanimous All-American this season. Sam was the more productive player this season, but at 6-2 and 255 pounds he’s considered a "tweener" at the next level who will likely have to move to outside linebacker in a three-man front. Ealy has the size NFL teams covet along the defensive line with the versatility to match as a guy who can play on the edge or move inside in the future. Ealy told reporters before this season that he received a third- or fourth-round draft grade from the NFL Draft’s Advisory Board following his sophomore season, in which he recorded 37 tackles, including 10 for losses, 3.5 sacks and one forced fumble. Ealy had much more of an impact this fall during the Tigers’ march to the SEC East championship, 11 wins and Cotton Bowl invitation. He recorded 37 tackles again but with 12.5 tackles for loss, 7.5 sacks, three forced fumbles, one fumble recovery and one interception that he returned 49 yards for a touchdown — all while drawing increased attention from opposing offensive lines. His two forced fumbles in the opening minutes against Auburn in the Southeastern Conference championship game showed what he was capable of on one of the biggest stages in college football. Ealy is already a hot name among writers who cover the NFL Draft and produce mock drafts on a near-weekly basis. If the junior defensive end is regarded as highly by NFL teams, his decision won’t be hard. Matt Miller of BleacherReport.com has Ealy being picked by the Tennessee Titans with the No. 11 overall selection of the 2014 NFL Draft. 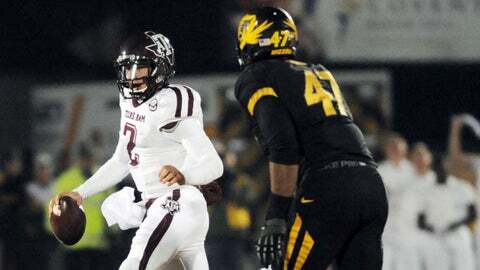 "Missouri’s Kony Ealy will draw comparisons to Aldon Smith, and they aren’t far off," Miller wrote this week. "Ealy is long but has strength on his 275-pound frame to attack blockers, runners and passers. He’s also versatile enough to play outside the tackle, head-up or even inside as a three-technique on passing downs." Rob Rang of CBSSports.com has Ealy going No. 17 overall in the first round to the Dallas Cowboys, while his colleague Dane Brugler of NFLDraftScout.com has Ealy being picked by the Denver Broncos with the 31st pick of the first round. "Ealy has first-round tools and his NFL ceiling is higher than his production in college would indicate," Brugler wrote. Ealy will have one more chance to impress the NFL scouts on the field when the No. 8 Tigers (11-2) take on No. 13 Oklahoma State (10-2) in the Cotton Bowl at 6:30 p.m. Friday at AT&T Stadium in Arlington, Texas. "They are very good up front and their ends are excellent pass rushers," Oklahoma State coach Mike Gundy told reporters Monday. "They have big guys up front who have good push on the offensive linemen. When we started to watch tape I was impressed at their ability to rush the passer." Cowboys quarterback Clint Chelf echoed his coach’s comments. He’s seen plenty of Ealy, Sam and the Missouri defensive line on tape. "The first thing that sticks out on film about them is their pass rush," Chelf said Monday. "Any time you have the SEC defensive player of the year on your team, that’s something to be proud of, and they can play. That’s something they pride themselves on is getting after the quarterback and making us uncomfortable and making us make bad decisions to force a turnover. So it all starts with them at defensive line. We’re going to have to be wary of that and hopefully protect." Chelf will see plenty of Ealy on Friday, but the Cotton Bowl could be the last chance for Mizzou fans to see Ealy in the black and gold before he joins his former teammates Richardson and Aldon Smith in the NFL. And on the mural at the MATC.